We are back in McAllen from a lovely – albeit wet – Thanksgiving trip to San Antonio… Our Thanksgiving table was sumptuous, and laden with rich, savory dishes we rarely consume. 😀 I am always ready to return to our more typical healthy fare, and Thai-Style Roasted Vegetable Soup was just such a dish! Roasting the vegetables until the edges are caramelized brings a lush complexity to the soup, and I think you’ll find it worth the additional time and effort. At the risk of beating the proverbial “dead horse,” I was able to come up with this recipe at the tail end of a 4 day trip because of my Well-Stocked Pantry, and my knowledge of flavor profiles. If you’ve followed my blog for awhile, you’ve heard me wax poetic about the benefits of keeping a well-stocked pantry and learning flavor profiles. To get this hearty soup on the table in under an hour, gather all the ingredients and preheat your oven. I am a huge fan of convection ovens, and I try to include cooking temperatures and times in my recipes as a convection oven reduces cooking time by about 20%, and you can lower your oven temperature by 25°, thus saving power as well. Convection roasting has the added benefit of doing a beautiful job of roasting everything! So prep the carrots, potatoes, onion, and grape tomatoes, and get them roasting. Roasting the vegetables should take about 35 to 40 minutes. 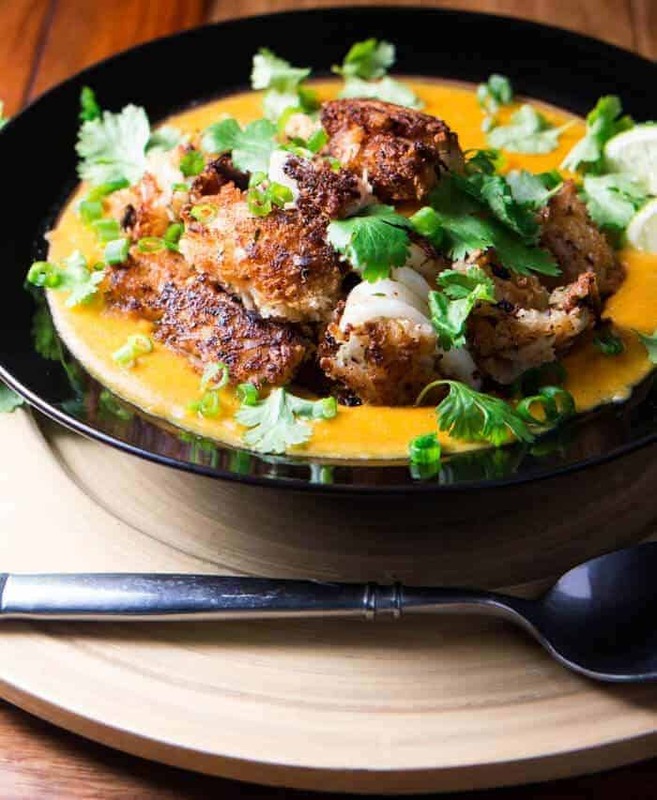 If you’re garnishing the soup with the Coconut Crusted Calamari, whisk up the batter and breading. To a dutch oven or heavy soup pot, add a bit of coconut and sesame oil, and turn heat to medium-high. Add the ginger and garlic. When it is sizzling nicely, add the broth/stock, lite coconut milk, curry paste, and fish sauce. Whisk to combine, then reduce heat to a low simmer. When the roasted vegetables have nice caramelized edges, remove them from the oven, and add them to the simmering soup. Cover the pot, and keep the heat at a very low simmer (not boiling). At this point the soup just needs to be puréed. If you plan to add a protein, complete that process at this time while the soup gently simmers. Lastly, purée the soup. I highly recommend using an immersion blender as it’s far safer and less likely to make a mess. Taste for seasoning. You may wish to add a bit more fish sauce and/or curry paste to taste. Garnish with fresh chopped cilantro, scallions, and that crispy, crunchy coconut coated protein. Delicious! Thai-Style Roasted Vegetable Soup would be equally delicious with shrimp or tofu, and is gluten-free if gluten is a concern. Keep in mind that it is possible to “fry” food and not serve “greasy” fatty food… The crunchy texture of the protein really complements the creamy soup, and the dish is healthy. Step it up a notch with this Thai-inspired savory soup! 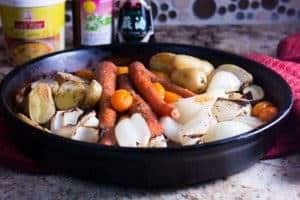 Thai flavors and roasted vegetables complement one another in this savor soup... curry paste, fish sauce, ginger, and coconut milk pair with roasted carrots, potatoes, onions, and grape tomatoes, and the result is so creamy and comforting. Pair it with Coconut Crusted Calamari (shrimp or tofu) for a truly amazing meal! Preheat the oven to 400 degrees (375 convection). Place prepared potatoes, carrots, onion, and tomatoes in a baking dish. drizzle with olive oil, and sprinkle with salt and pepper. Place in the oven. Cook until edges are brown and caramelized. This will take anywhere from 30 (convection) to 45 (standard) depending on size and actual temperature of your oven. Meanwhile, in a dutch oven or heavy soup pot, heat coconut oil and sesame oil over medium-high heat. Add ginger and garlic. Stir-fry until sizzling and fragrant. Add broth/stock, coconut milk, curry paste, and fish sauce. Whisk until smooth. Reduce heat and cover. If you're including a coconut crusted calamari, shrimp, tofu, etc., get the batter and breading prepped and ready to fry. Check the roasting vegetables, and remove if tender and caramelized. Add to the soup pot. Fry protein if using. Drain on paper towels. Puree the soup using an immersion (or other) blender. Keep hot but not boiling until ready to serve. Ladle hot soup into deep bowls. Top with fried protein if using. Garnish with chopped cilantro, scallions, and lime wedges. Enjoy! This is a great vegetarian dish. Use a good quality vegetable stock, and garnish with coconut crusted tofu (recipe to follow this post). I typically use "lite" coconut milk to cut fat and calories. Of course a "homemade" curry paste is awesome, but I do keep Thai curry paste in my well-stocked pantry. I would use yellow (milder) or red in this recipe because they work better with the orange/yellow vegetables. I love anything and everything Thai! This recipe is one I know I will love! Very colorful - beautiful photo! I love the flavours you have going on in this dish and the coconut milk will give it that wonderful silkiness, gotta make this! It's hearty and full of flavor for sure! I hope you give it a try! This looks so full of flavor and cozy! I've never pureed a Thai pureed soup. I'm going to have to give it a go! This looks incredible!! So hearty and delicious! I almost have all the ingredients for this, and I know my family would LOVE it! Cool! Let me know if you try it Dini... and thanks a bunch for stopping by! Love all the fresh vegetables in this recipe. Sounds like a simple yet delicious meal that the hubs would love during a busy weeknight. Fresh vegetables are the best! Thanks Jessica! I have to try this and I can taste how good it is just by looking at your photo! Thanks Kathy! I hope you do :-) Thanks for commenting on the photo...That's my biggest challenge as a food blogger! Roasted vegetables have so much more flavor, and why not spend a few extra minutes to do it that way, right? I hope you do try it, but I know how hard it is for food bloggers to get around to doing that ;-) And you have a little one! Oh, I'm with you on the well stocked pantry (and freezer...) I can do anything with that! Makes life so much easier. I like the pureed roasted vegetables - that must give wonderful flavor. 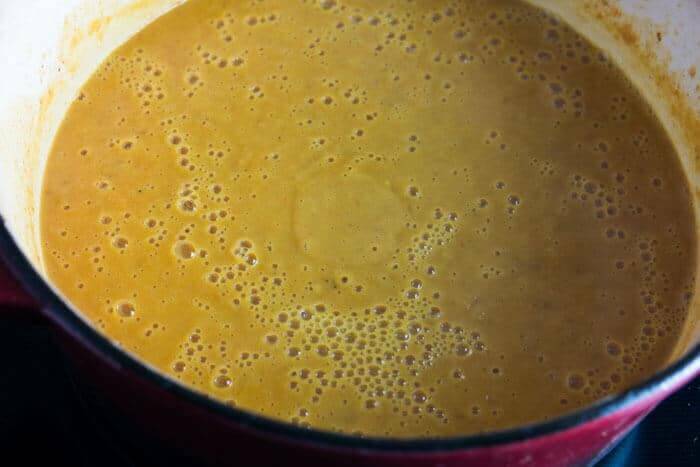 What a great looking soup! I'm just dipping my toes into Thai flavors ... this is going on my to'do list. Thai flavors are among my most favorite! I hope you do give it a try! I am a big fan of Thai cuisine. Love the texture the addition of the toppings provide. I must give this a try -- including the coconut calamari. I love the rich taste of coconut milk and curry, particularly with some nice, crispy-fried protein. What a great pairing of flavors -- Thank you! This looks so hearty and delicious! I love nothing more than a bowl of homemade soup, I need to try this! YUM!! Love this soup! Lots of textures and flavors. Thai curry paste is a must for any pantry - which yes - every good cook must have a well-stocked pantry! I love going into my friends' pantries. I always find something new. What would I find in yours? ;) Lovely soup! Sometimes I feel like I'm "beating a dead horse" in talking about that well-stocked pantry, but honestly, that is how I cook! I'm so excited at having new markets - especially ethnic markets - and that pantry is getting pretty well stocked! I've got to go hunting for some cranberry balsamic though ;-) Thanks MJ! My latest find is zereshk... It may be part of a pomegranate molasses glazed duck with a saffron and zereshk rice pilaf for Christmas. Merry Christmas!